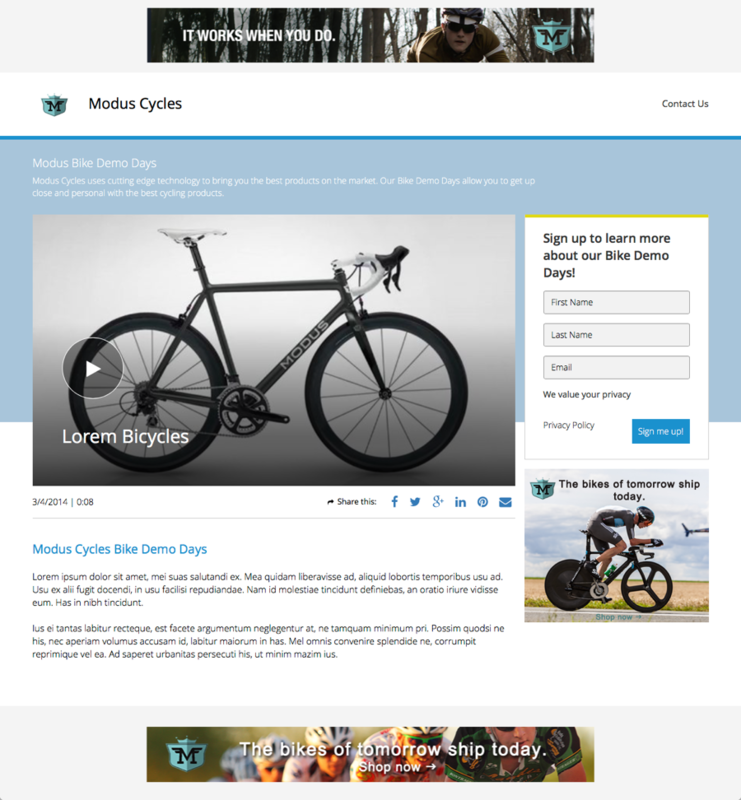 In this topic you will learn how to create a landing page experience. The Landing Page template allows you to create an experience that displays a single video and can optionally capture viewer information. For example, you might create an email blast for a new product with a link to a landing page site. The site would display a product video and allow viewers to enter their information to receive more information. The process to create and publish a Landing Page experience is similar to experiences that use the other templates. However, when creating a Landing Page experience, there are some layout options and site settings documented here that you might want to take advantage of. To create a Landing Page experience, follow these steps. Open the Gallery module and click the Experiences link at the top of the page. Click New Experience. A list of templates will display. Locate the Landing Page template and click Choose. The Gallery Site Editor will open. 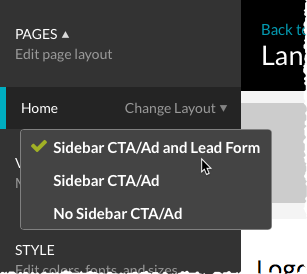 In the Gallery Site Editor, click PAGES in the left navigation. Click the Change Layout dropdown. The preview in the Gallery Site Editor will update to display the layout. A single video, images, text, links and calls-to-action can be added as needed. For information on using the Gallery Site Editor to customize the site, see Using the Site Editor to Customize a Portal Experience. Click VIDEOS in the left navigation. Select a Video Source, both Video Cloud and YouTube are supported. Playlist - The video resides in a playlist. Select a playlist and then select the video. Search - Enter search criteria for the video. 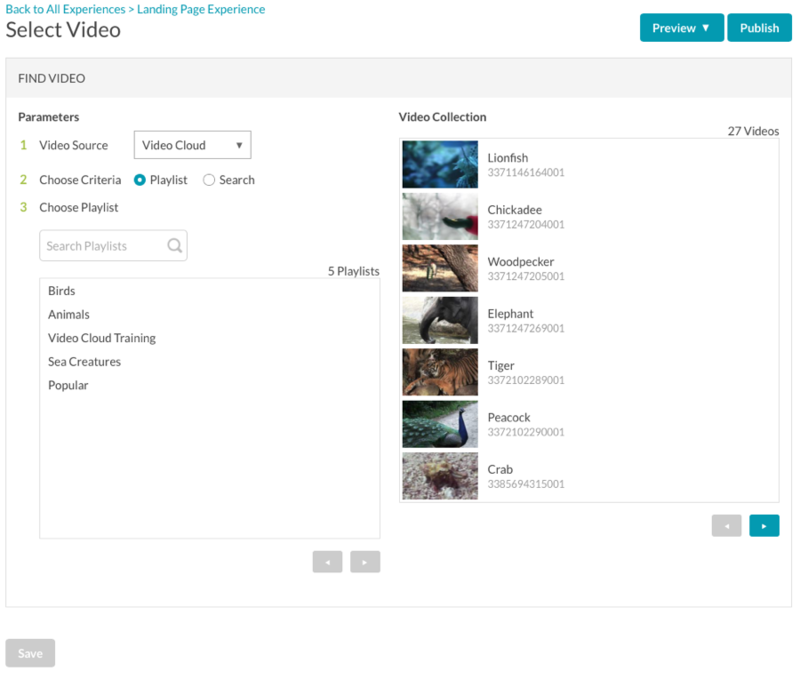 The Video ID, name and short and long description fields will be searched. In order to use a lead form, an Audience-enabled player that is configured with a lead form must be selected. To select an Audience-enabled player to use on the landing page, click VIDEO AND PLAYBACK > Player and Lead Form. 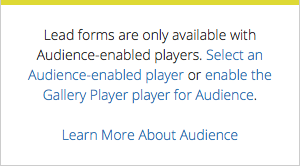 Audience-enabled players are indicated with an Audience icon ( ). After an Audience-enabled player is selected, the dialog will update to display the lead form and Audience connection information. 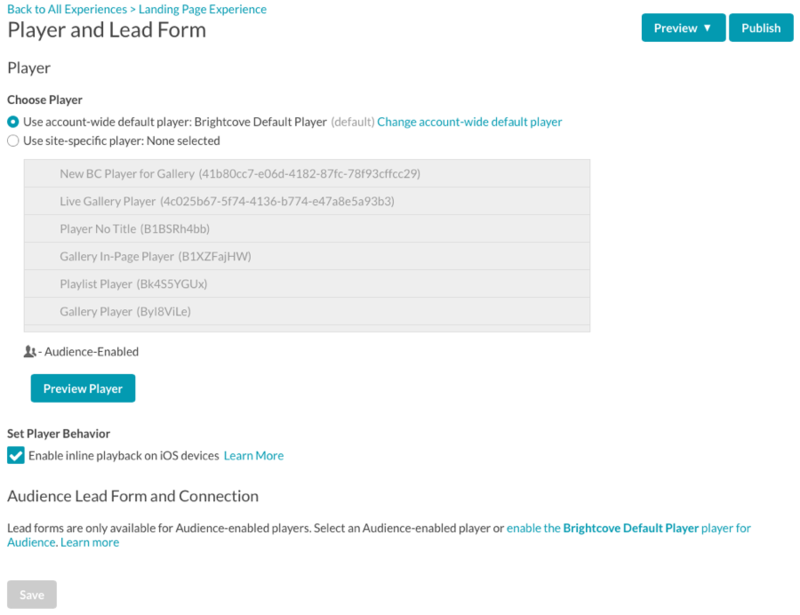 For information on creating lead forms and working with Audience-enabled players, see Using a Lead Form with a Portal Experience. Custom domains and subdomains provide an easy way to publish the site on a unique URL. 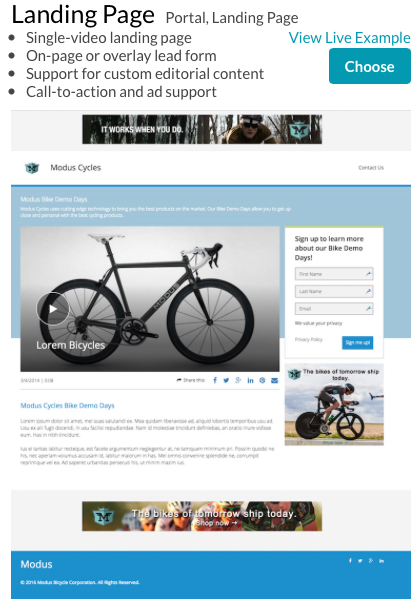 For example, you may create multiple landing pages and have them published to mycustomurl.com/bike_campaign and mycustomurl.com/shoes_campaign. For information on creating custom domains, see Configuring Custom Domains and SSL and Assigning a Custom Domain to a Portal Experience. All data captured in lead forms can be exported using the Audience module. For information, see Exporting Gallery Lead Data. Note: Only users with Administrator privileges will be able to export the lead data.